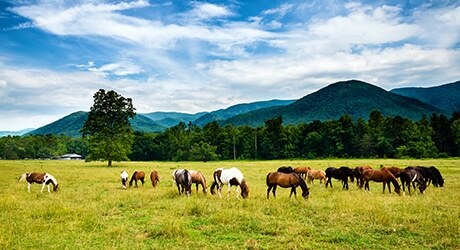 Cade’s Cove is the most visited area of the Smoky Mountains. Roughly 31 miles away from the city of Pigeon Forge, Cade’s Cove is in the 6,800-acre valley known for its picturesque landscapes. European settlers settled here in the early 1800s, contributing to why Cade’s Cove has the largest variety of historic buildings in the entire national park. As you make your way through the area, you can see historic structures like restored churches, old grist mills and pioneer log cabins. The enriched history of Cade’s Cove has left its lasting mark with its presence still felt today. During your visit to Cade’s Cove, keep an eye out for all the wildlife in the park. With such a diverse array of animals, from raccoons to white tail deer to black bears, you are sure to have the chance to spot one. Always remember, don’t approach the animals too closely to help preserve the animals’ environment and to maintain your safety. The best way to soak in the beauty Cade’s Cove poses is to take a leisurely drive on the Cades Cove Loop Road. 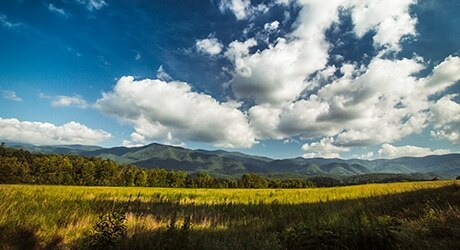 It’s an 11-mile paved one-way road that winds through the Great Smoky Mountains National Park, offering scenic views of the mountain tops, wildflower meadows and rolling greens. The entire loop takes anywhere between two and four hours to drive through, but you’ll wish it wouldn’t end. From May to September on Saturday and Wednesday mornings before 10 a.m., only bicyclists and hikers are allowed on the loop road to experience Cade’s Cove at their own pace. Cade’s Cove is filled with jaw dropping trails and waterfalls in its forests. Abrams Falls is a striking waterfall with a 20-foot drop to a pool and stream located below on Abrams Creek. Along the number of hiking trails, there are numerous opportunities to soak in the serenity of the landscape’s mountains and take pictures.